A spokeswoman for Ofsted dismissed the think tank's claims. "There is little new in the report and several inaccuracies. Some of it we have said ourselves and are addressing through our new inspections, which will launch this autumn," said the Ofsted spokeswoman. "We are open to serious debate about how we inspect, as shown through our recent consultation on a new inspection approach. We will be publishing the outcome soon." This consultation on changes to Ofsted inspections is about to close, with suggestions from the watchdog that there should be less focus on exam results and performance data. Ofsted chief Amanda Spielman has warned about the risk of schools being steered by inspections to focus "too narrowly on test and exam results". 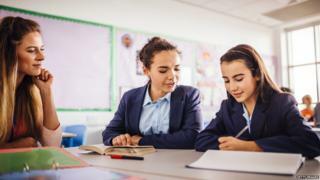 Mary Bousted, joint general secretary of the National Education Union, said there needed to be a "fundamental overhaul of the accountability system". She said that "tinkering with the Ofsted framework will make no helpful difference to the government's desire to improve teacher or head teacher recruitment, retention or wellbeing". The Association of School and College Leaders welcomed the proposed change of emphasis as a "step in the right direction". The heads' union leader Geoff Barton said this could be an "important reform". Nick Brook of the National Association of Head Teachers said: "The ambition in Ofsted's proposals is sound, but the reality is problematic. We recognise the good intent, but school leaders are unconvinced by the detail." Earlier this week, two other head teachers' organisations, the Headteachers' Roundtable and WorthLess?, sent a joint statement rejecting the grading system for inspections as "hugely problematic". The heads groups said there was an "absence of any independent empirical evidence" for the "reliability of the grades produced and the validity of conclusions". They warned that the outcome of inspections could be too "dependent on a school's intake rather than its effectiveness".